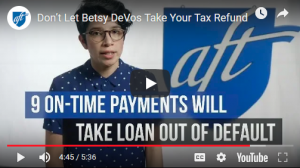 We’ve heard all kinds of stories at the AFT’s student debt clinics, where we’ve helped hundreds of members lower their monthly payments and avoid interest they shouldn’t have to pay. If you’ve defaulted on your student loans—meaning you haven’t made a payment in over a year—you’re not alone. Three thousand people default every single day. And every time someone defaults, they risk losing any tax refund they may be counting on to pay rent, utilities, and other basics. We think a system that results in 3,000 people defaulting on their loans every day is deeply flawed—and we’re working on a policy that would fix that system rather than punish folks who are already struggling to pay for school. Meanwhile, we have some advice about how to keep your tax refund if you haven’t filed yet, even if you are in default. Every year, the Department of Education garnishes more than $2 billion in tax returns because of unpaid student debt. This is a silent crisis affecting more than 9 million student loan borrowers. You have options though! Watch the video to find out what steps to take today. Use Facebook and Twitter to help other borrowers hang onto their refunds.